This Frenchman and Miami Indian wife operated a trading post on the west side of Wildcat Creek a mile south of its flow into the Wabash. A Winnebago Indian village of 140? huts stood on the opposite side of the creek. His eldest son, Peter, Jr., born __ the post about 1803. Operated it while his father conducted a branch in Logansport and died __ 1834. 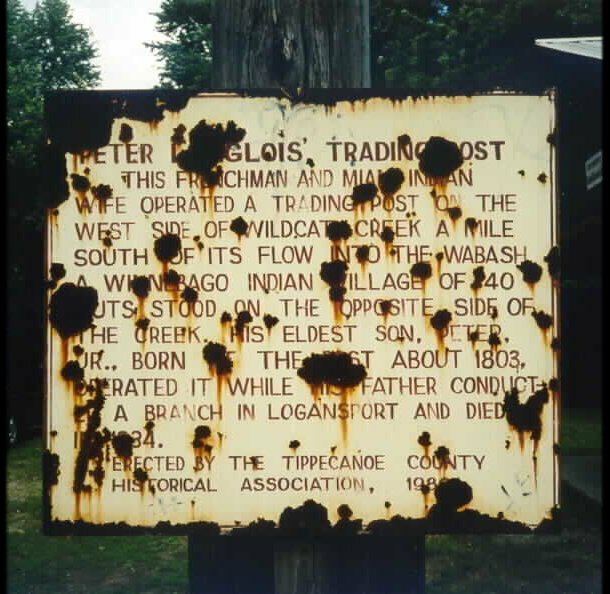 Peter Langlois Trading Post was located on the Wild Cat Creek just east of Springvale Cemetery and north of State Road 25 northeast of Lafayette. Peter Langlois was a half-breed chief of the Potawatomi Indians.